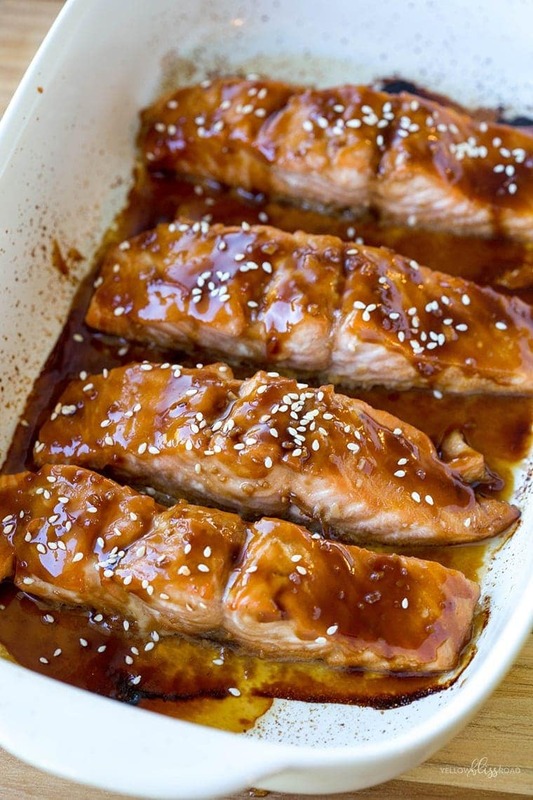 This easy recipe for Baked Teriyaki Salmon is sure to become a family favorite. 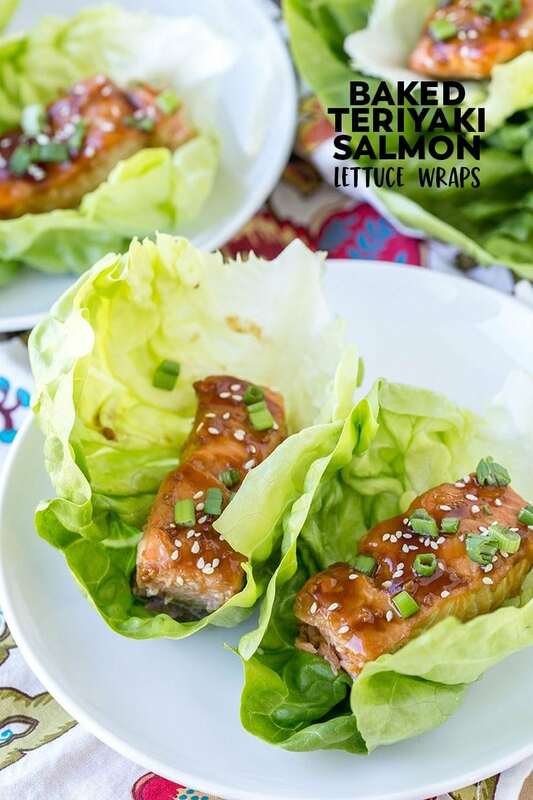 Nestled in crisp lettuce cups, these Teriyaki Salmon Lettuce Wraps are a protein-packed meal for lunch or dinner. In my younger, pre-children days, some friends and I would frequent a local Japanese restaurant nearly every weekend. The food was phenomenal, and that’s really where my love of sushi began. Along with sushi, we would order the barbecued salmon (which had a sweet teriyaki flavor) and the tiger shrimp lettuce wraps with this incredible, creamy sauce. They were seriously amazing, and we would gorge ourselves to the point you’d think we would have rolled out of there. 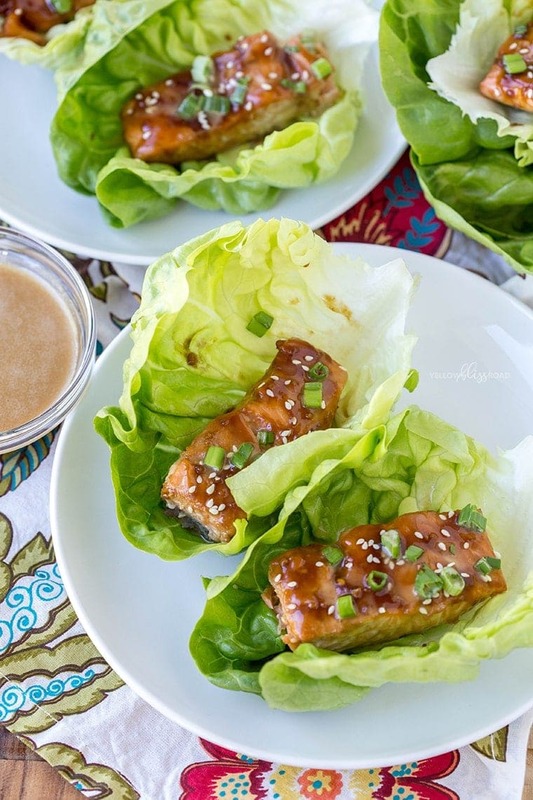 This particular recipe is a bit of a combination of the barbecued salmon and the shrimp lettuce wraps. 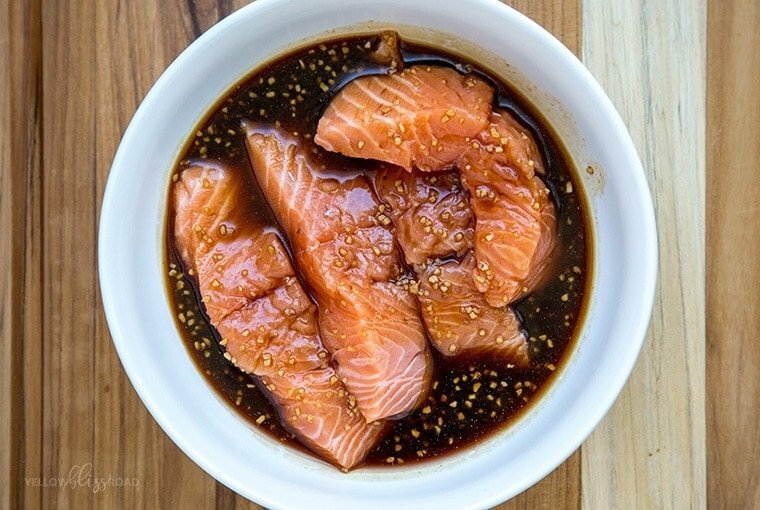 Small portions of salmon are marinated in a sweet, homemade teriyaki sauce for a good 30 minutes, or longer if you have the time. The salmon pieces are then cut in half (or not depending on the size of your lettuce cups), and placed on top of each lettuce cup. The finishing touch is that creamy sauce, which is really just a combination of mayo, soy sauce, ginger and honey. 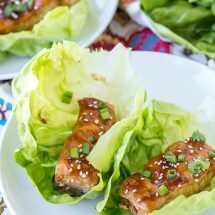 Baked Salmon Teriyaki is my absolute favorite way to eat salmon, in lettuce wraps like these, or just over a bed of rice. There is just something about that sweet sauce atop that mild fish that makes me beg for more! I seriously don’t make it enough…but I think I’m going to add it to our weekly menu starting today! What about you…what’s your favorite way to eat salmon? 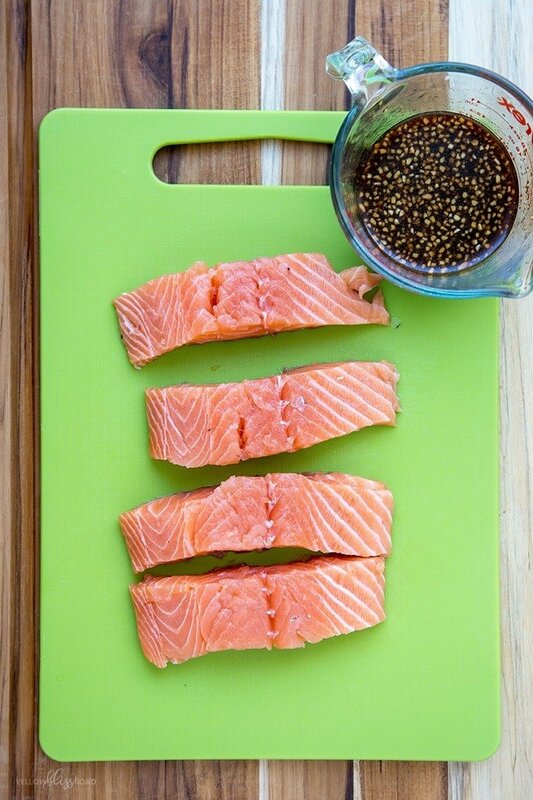 Divide salmon into 4 equal size pieces. In a medium size bowl, whisk together teriyaki sauce, soy sauce, brown sugar, garlic, olive oil and rice vinegar until well combined. Place salmon pieces in the teriyaki mixture and coat completely. Cover the boil with plastic wrap or foil and place in the refrigerator to marinate for 20-30 minutes. Meanwhile, divide lettuce leaves, keeping each leaf in tact to form "cups." Wash gently and set aside on paper towels to dry. Preheat oven to 400 degrees F. Spray a medium size baking dish with cooking spray. 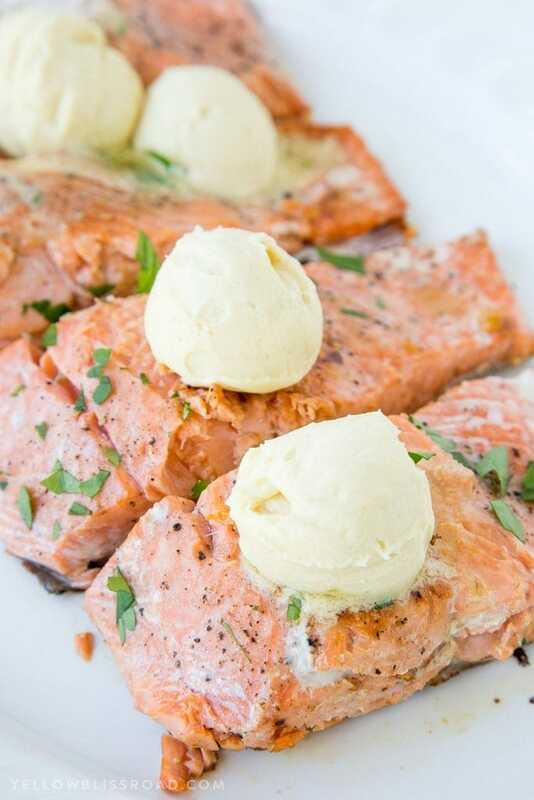 Arrange salmon (not touching) in the dish and bake for 12-16 minutes, reserving the sauce. Cooking time will depend on size and thickness; it's done when the salmon is a light pink color and is tender and flaky. While the salmon is baking, pour the sauce into a small saucepan and bring to a boil over medium heat. Reduce heat to low and stir often, until sauce is reduced and thickened; about 4-5 minutes. You will know it's done when it coats the back of a spoon. Set aside. Remove salmon from the oven. Pour thickened sauce over each piece and garnish with sesame seeds and green onion. If using for lettuce wraps, cut each piece in half. 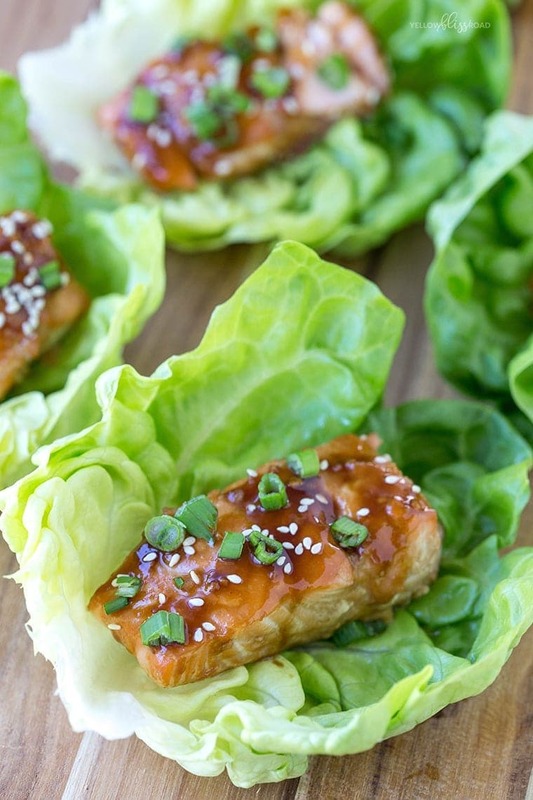 Arrange 8 lettuce cups on a platter and place half of each piece of salmon in the cups. Drizzle with Creamy Ginger Soy Sauce (recipe below), if desired. Hi. Thanks for the awesome recipe. This is the only way I let salmon now. Do you happen to have the nutritional information for this recipe? Salmon teriyaki is my favorite way to eat salmon! I am working on adding nutritional values to my recipes, but it will take some time. In the meantime, I recommend checking out myfitnesspal.com which has a great nutritional calculator. Hi Kristin, I made these yesterday and whilst a winner with the guests I was not sure if I did it right. I boiled up the remaining marinade as you said, but was I then to add that to the creamy soy ginger sauce to become the one drizzling sauce? Bringing the two together was was not in the instructions? The combined components were yummy by the way. Those are two separate components. The teriyaki is a sauce that coats the fish, so the remaining marinade can be drizzled over. The creamy ginger sauce is a second sauce for dipping the whole wrap. The flavors all compliment each other very well.